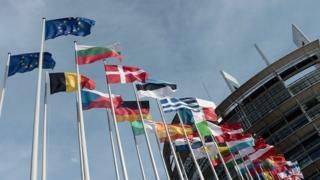 The European parliament will take a key vote on Tuesday on rules affecting how internet traffic is managed. MEPs are considering a new set of rules for telecoms companies inside the EU. The plan could have major implications for net neutrality, where traffic is not slowed down or priced differently because of its content or origin. Some people fear the plan may lead to such restrictions but others argue that first it would have to be turned into specific regulations. Some tech companies, campaign groups and the inventor of the web Sir Tim Berners-Lee have all called for the adoption of amendments to the rules, which they believe would better safeguard the principles of net neutrality. However, this would mean rejecting the plan in a form to which EU governments have already agreed. Another part of the legislation, which would abolish mobile roaming charges within the EU, is popular with MEPs, so enthusiasm for rejecting it in its current form and further delaying this move is low, according to some analysts. The idea that data should be ferried from place to place as quickly as possible, regardless of what it is, is how most people assume the internet works. That's the essence of net neutrality. However, it's possible to decide to prioritise certain types of data over others - perhaps, for example, by charging the producers of such data a fee to make sure their content gets delivered promptly. For big video streaming sites, the prospect is worrying. They could find themselves coughing up lots of money in fees simply to give their users the same experience as before. Some argue, however, that such fees are fair since it costs internet service providers a lot of money to keep providing such content, no matter how popular the streaming sites become. What are MEPs voting on? The plan that members are actually voting on is a proposed set of amendments to the rules governing telecoms companies that work inside the EU. If they decide not to adopt the amendments, that will count as acceptance of the proposal in its current form. The amendments make an attempt to highlight the significance of net neutrality principles, such as applying the same scrutiny across networks regardless of their market share. But telecoms law expert Chris Marsden at the University of Sussex told the BBC there is reluctance within the parliament to do this because it could delay and possibly jeopardise other parts of the rules which aim to abolish EU roaming charges. "If the parliament votes for [the amendments] and they amend the text that the governments had all agreed to - then the whole thing would actually fail [if the Council of Ministers also rejects the plan]," he explained. In that case, a further reading of the rules would have to be arranged. How could the rules affect internet use? Part of the problem with the rules in their current form, argued Joe McNamee at the European Digital Rights campaign group, is that they are ambiguous. "As the text currently stands there is no indication as to how much abuse of dominance would be permissible under this arrangement," he told the BBC. The sort of scenarios that could impact internet use include the creation of "fast lanes" and "slow lanes" or the creation of "zero ratings" in which some services may be accessed without using up any of the internet user's data quota. In Belgium, for example, some mobile phone companies currently allow unlimited access to Twitter and Facebook while all other data usage is part of a monthly plan. In a few countries such as the Netherlands, such practices are not allowed. However, regulators would have to decide on the specifics of what would and would not be allowed before any EU-wide changes could be enforced. Who is arguing that the amendments be adopted? Besides a host of net neutrality campaigners, inventor of the world wide web Sir Tim Berners-Lee has added his voice to those supporting the amendments. "If adopted as currently written, these rules will threaten innovation, free speech and privacy, and compromise Europe's ability to lead in the digital economy," he wrote in a blog. Meanwhile a string of tech companies have signed a letter to the president of the European Parliament, Martin Schulz, asking MEPs to adopt the amendments. The firms include Netflix, Tumblr, Vimeo, Kickstarter and Reddit. "I was contacted by a number of start-ups and investors because they were deeply concerned about the impact of the European Parliament's network neutrality proposals on start-up innovation in Europe," Stanford professor Barbara van Schewick, who helped pen the letter, told the BBC. Is it likely the amendments will pass? In order for the amendments to be adopted, they would have to achieve an overall majority of MEPs - 376 out of 751 members. Dr Marsden believes this is unlikely but Dr van Schewick said she believed there was some growing momentum within the parliament on incorporating the changes. Do other countries have net neutrality? Interestingly, three countries within the EU - Netherlands, Slovenia and Finland - already have a range of net neutrality rules enshrined in law. These laws might have to be altered depending on how any new, EU-wide rules are interpreted by regulators later. Elsewhere, net neutrality has received some regulatory protection in the United States after a vote in February this year placed new restrictions on what deals could be sought by internet firms with content providers. But in other countries, such as India, "zero rating" is allowed. "It's a fragmented picture across the board," said Dr Marsden. "It's an extremely difficult area and there are probably no absolutely right answers." Video What does net neutrality mean?